Aldo Hwedo: It is said that this large rainbow serpent of West African myth holds the world together. She rests in the sea coiled around the world. It is believed that when she trembles, the earthquakes! Ammut: This chimeric Dragon is known as the Eater of the Dead or Eater of Souls. Ammut has a crocodilian head and a furry beast-like body. She waits with Anubis, the jackal-headed god of death, while he weighs the souls against the Feather of Truth on the Scales of Judgement. If the soul is heavier than the feather, then it's consumed by Ammut. Apep: This Egyptian sea is a symbol of chaos, instability, and eclipses. Apep chases the sun god Ra through the underworld every night, trying to swallow the sun. Sometimes Apep swallows the sun, causing an eclipse, but he always regurgitates it. 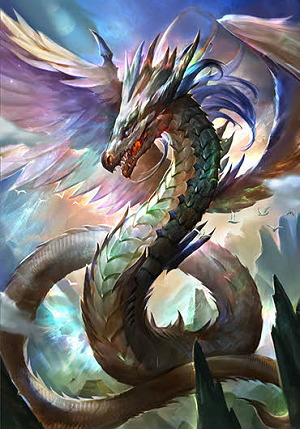 Tiamat: Coming from Assyrio-Babylonian mythology, the great sea Dragon is the mate of Apsu. 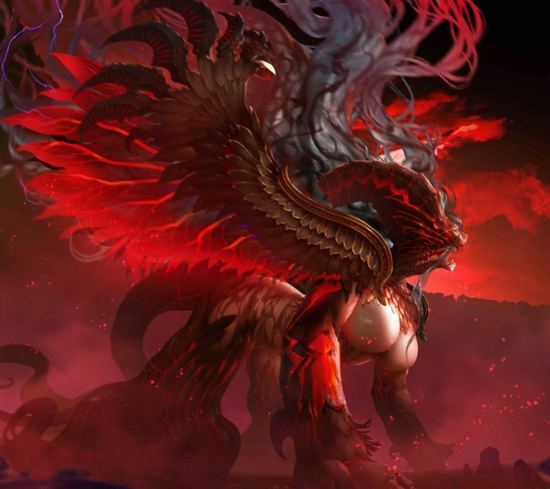 Tiamat and Apsu created all the varied gods and goddesses. Wadjet: A female winged serpent in the form of a cobra. Wadjet breathes flames. She is a symbol of royalty and her images appear on the crowns of the Pharaohs. Bobbi-bobbi: A rainbow serpent who took one of his own ribs to create the boomerang so people could hunt animals for food. Bunyip: Chimeric Dragons of Australia that are as old in myth as the rainbow serpents. 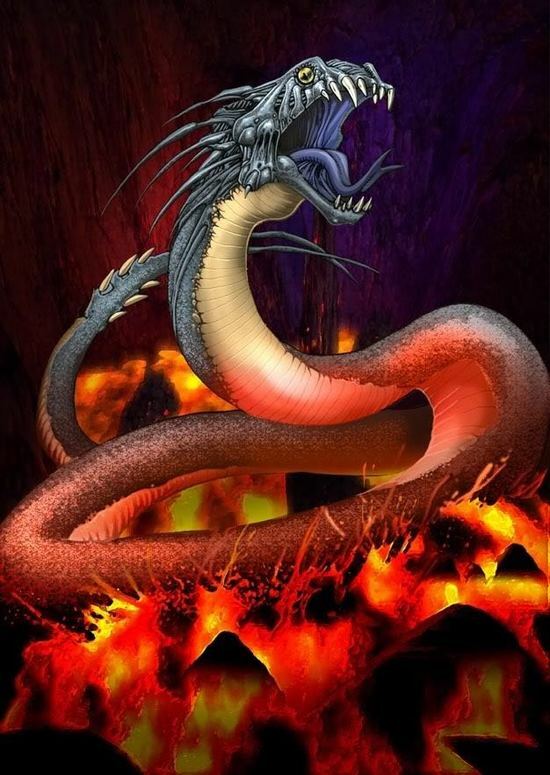 These Dragons are often huge serpents with long, oversized ears. They are known to be masters at shapeshifting and will likely choose to take on the appearance that they find most amusing. So we have Bunyip that look like huge versions of existing Australian creatures and some Bunyip will be made up of many different animals. However, they will not shy away from eating people. They have fierce tempers and will flood the land when they are angry. These Dragons show up in the game Culdcept. Taniwha: These Dragons live in the deep depths of the oceans and rivers. They can also be very violent. Tuteporoporo: A famous taniwha, he lived in the Whanguanui River. This Dragon was a pet off Chief Tuarki, Sadly, he turned feral, started eating people and therefore had to be slain. Warramunga: This male serpent is a creator god and a symbol of spring. Something special about him is that he is blind. He creates rainbows as he flies from one waterhole to another. He is also known as Wollunqua. Yurlunger: This male rainbow serpent is the Great Father and, just like Warramunga, was also a creator god. He's a symbol of a boy becoming a man and of fertility. His voice sounds a lot like thunder. Well, this concludes the "Dragon where are you from" series. I really hope you enjoyed learning about the different Dragons from around the world. It's fascinating to see how much of an impact the Dragon has left on people, so much that you'll find a Dragon in every culture of the world! Of course, there are a lot more Dragons to add to each part of the world from this series, but then it would be too long. And it would probably take more than three days to conclude. I also tried to find the best pictures I could, some of these Dragon didn't have good pictures. So I did my best with the pictures. ← Back to Dragon and Goth Stories, Myths and Lore!